"I would highly recommend taking one of Shawna’s raw food classes. She is truly passionate about eating healthy — which really shows. She has the best recipes that are creative, fresh, and surprisingly easy to make. I left her class beyond satisfied and was full of new tips and tricks. 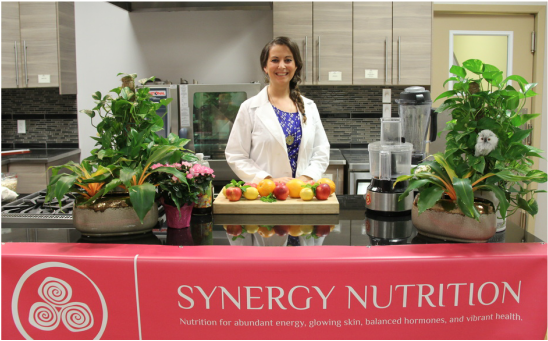 Thank you Shawna, for sharing your wealth of raw food knowledge and experience with others!" Become a Certified Raw Food Chef in this informative, action-packed, 4 hour course. Learn about raw food nutrition, raw food preparation, flavour balancing, and food combining. Learn how to prepare 7 gourmet recipes that are ready in 5-10 minutes! ​Bring your appetite, samples of each recipe are provided. raw food diet through the teachings of the Living on Live Food plan. What a raw and living food diet is. How to make delicious raw food meals that taste just like your favourite cooked food dishes! How to prepare gourmet raw food meals, simply and easily. raw and how to make delicious raw food meals for yourself and others. ​continue on to the next level of the Living on Live Food training. Handouts and recipes are provided. Space is limited, register today to reserve your seat. ​more beautiful and radiant you! © Synergy Holistic Nutrition 2013-2018 All Rights Reserved.